Built in 2001 in a peaceful environment, the Residence Mona Lisa allows to live stays in any complicity with the mountain and his big natural spaces. Consisted of 63 spacious and comfortable apartments completely equipped at feet of tracks which can welcome from 2 to 8 persons. All the apartments possess a balcony or a terrace. 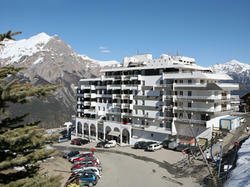 Thanks to an exceptional place, you will put shoes on skis at feet of the residence. In Puy St Vincent the animation is sacred! The resort proposes in the smallest several activities: descent in Chinese lanterns, races of buoys, shows. 4 gardens of snows to accompany them towards the glide.